This is another model I have had for awhile but never took proper pictures of. 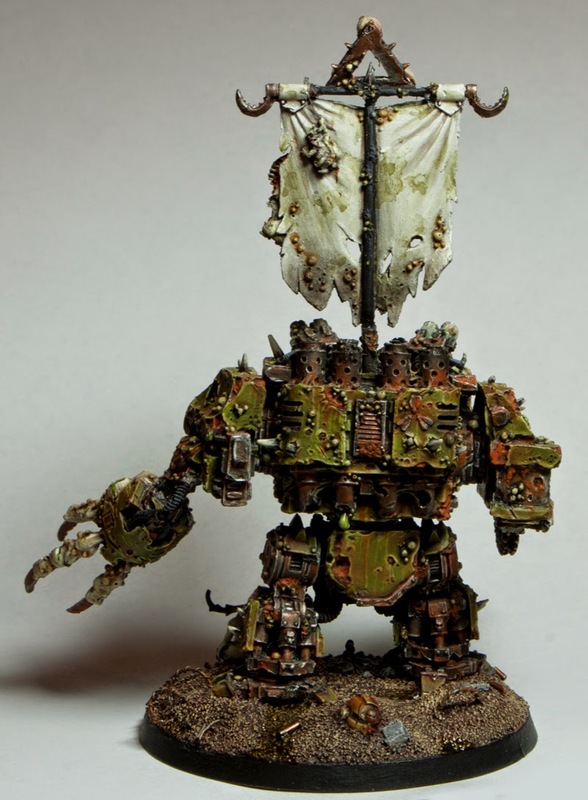 This is one of my favorite and most delicate models, my Death Guard Dreadnought. 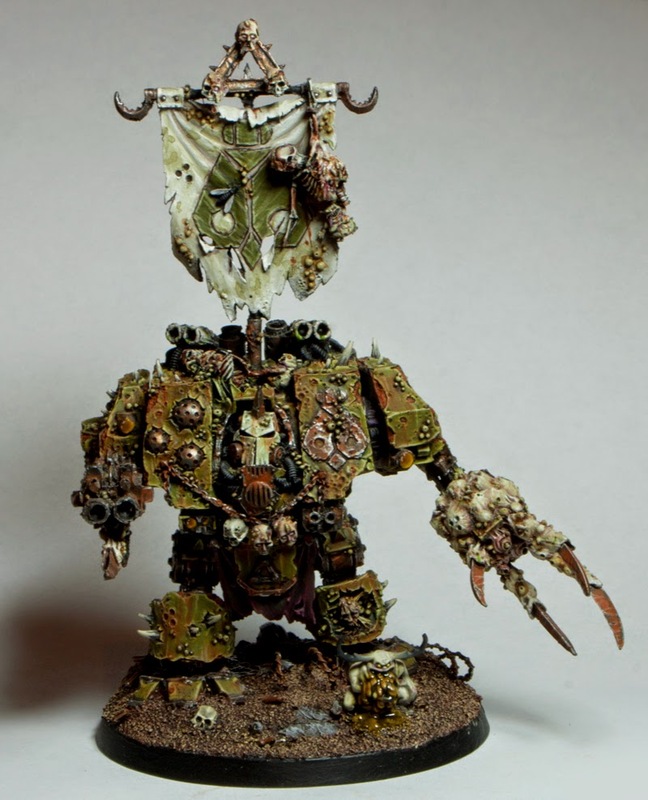 I painted this guy way, way back in 2010 when I was first applying to join the 'Eavy Metal team. Obviously I didn't get the job, but I wanted to have at least one really good display model in my portfolio. I forget exactly how long he took, but at that point it was the longest I had spent on a single miniature. 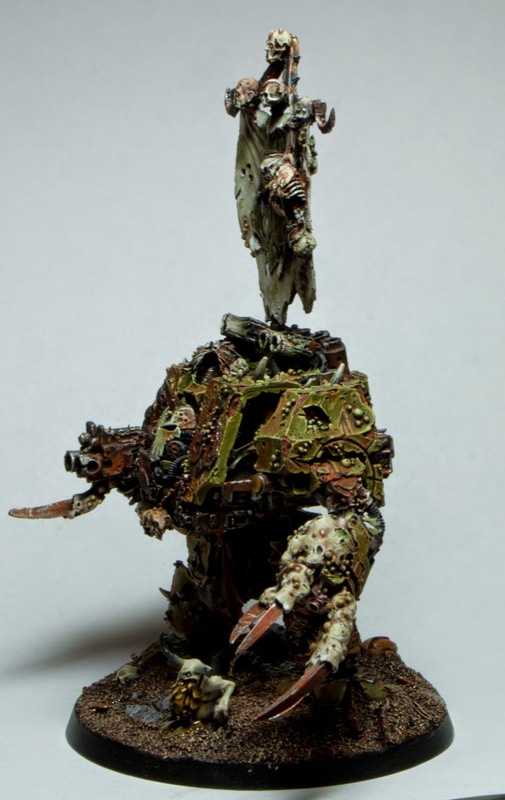 This guy was my first real step into competition level painting. I distinctly remember being really proud of how he turned out. 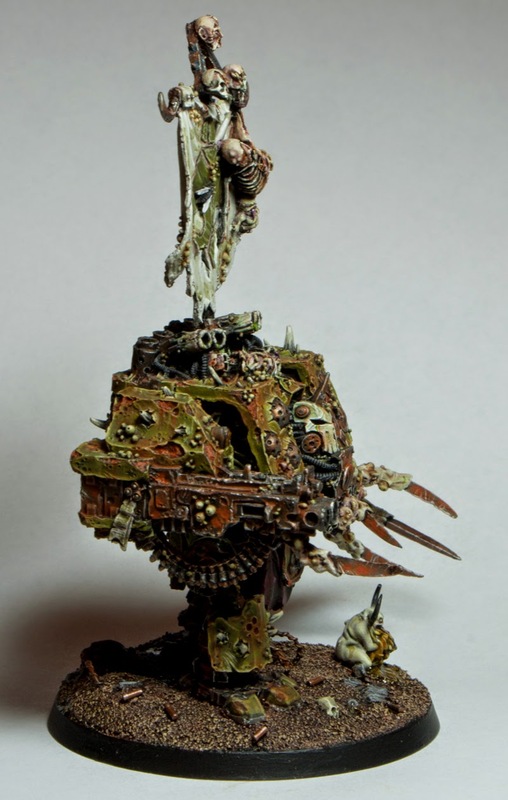 Since then my Death Guard scheme changed slightly, mostly just the bases and using some weathering powders. I can't stop myself from tinkering with older models so I went back and updated this guy. 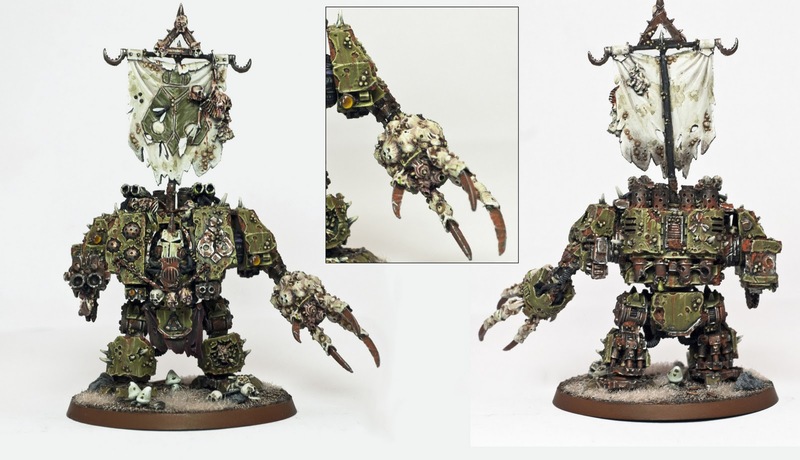 The biggest change of course was the base, which I feel really compliments the model. I just had to include one of the new Nurglings, these guys are some of the nicest sculpts in the demons range along with the Plaguebearers. It was an interesting challenge trying to figure out how to make the vomit pool around the Nurgling's feet, but after some trial and error I came up with a mixture of paint and water effects. Unfortunately this guy has broken several times. Forge World is beautiful but very delicate. 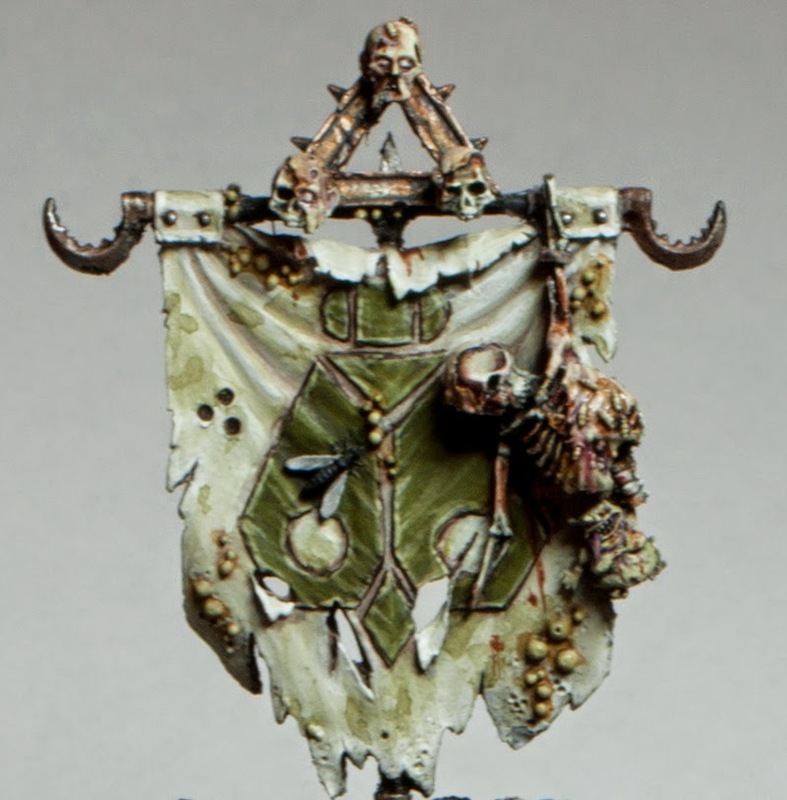 I decided to enter this guy into the 2013 Golden Demons and when I was packing him up for the flight his banner pole broke near the base. After pinning it back on he was good to go. I am very happy with how he did at the competition, taking a finalist medal at the end of the day. I didn't really expect him to almost win since he is a few years old. On the way back home he broke again, this time one of the hooks on the side of the banner, the top spike and the pole again, but in a different spot! All fixed relatively easily. Unfortunately though he lost the spike again during a game and I wasn't able to find it. After another game just a month or so ago his banner pole broke for a third time, luckily along one of the old breaks, and the pin was still in it so I just glued it back on, no fuss. At this point he may become solely a display model and only used for games where he doesn't have to travel far. I just don't think that banner is designed for transport. Considering he was one of my first serious display pieces I am happy that he still holds up pretty well against my current stuff.